Students at the Community Day School in Squirrel Hill lead the school in a daily prayer service. “I said ‘how many of you felt vulnerable?’ They all raised their hands. And that was it, the floodgates opened and they were all presenting what emotions they were going through,” she said. Research about these types of interactions between students and educators is clear: it’s most important to give students space to talk about tragedy. Goldblum and her Community Day School colleagues met with groups of students Monday just two days after 11 people were killed at the Tree of Life Congregation Saturday morning by a lone gunman. Goldblum said students comforted each other and a few broke down. “I think they had a hard time processing, but I said 'that’s OK,' because adults are having a hard time processing,” she said. One of her students said she was concerned that these tragedies are becoming part of American life. She was worried Squirrel Hill would soon be forgotten. The alleged shooter, Robert Bowers, has a history of posting anti-Semitic rhetoric online. Goldblum’s 8th graders know a lot about anti-Semitism. Students in the independent school are immersed in Jewish values and teaching to understand their identity and connection to the land of Israel. They also examine cycles of persecution against Jewish people. In middle school, students begin to study the Holocaust and patterns of scapegoating and desires for heterogeneous counties that excluded Jewish people. “People ask me how we prepare them for this and we’re preparing our kids every day,” she said. Goldblum uses a curriculum called Facing History and Ourselves to examine how anti-Semitism has shaped thoughts, judgement and behavior around the world. In 7th grade students learn about identity and how communities help mold identity. They study stereotyping and labeling. She said her students have a deep knowledge of anti-Semitism, but they never thought it would come into their community. Her students, she said, have a sense for social justice. Many have been active in movements for refugee and immigrant rights. “They know that we were immigrants coming in and sent into exile many times in our history,” she said. Bowers allegedly targeted HIAS, a refugee resettlement agency that works with Dor Hadash congregation, which rented space at the Tree of Life synagogue where the attack took place. Community Day School Head of School Avi Baran Munro has been with the school for 15 years. She said the older students processed their grief through action. They organized a remembrance ceremony Tuesday where they read poems, sang songs and lit 11 candles for the victims. 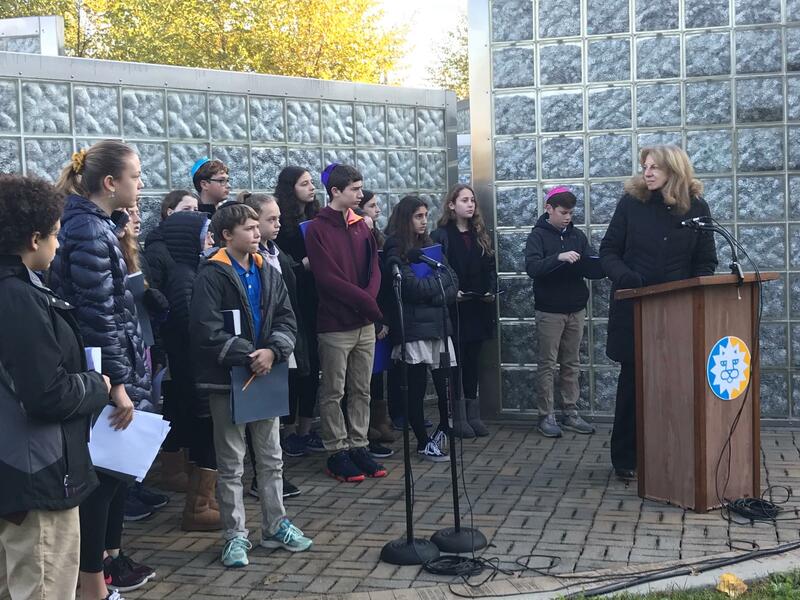 Avi Baran Munro thanks her students for organizing a remembrance service for 11 people who were killed in a synagogue near the school Saturday. The service was held in front of the Keeping Tabs Holocaust Sculpture. The glass blocks in the shape of the Star of David are filled with six million aluminum "tabs" to represent human lives lost at the hands of Nazis. AJ Tannenbaum, 13, said the shooting felt different than other mass shootings. “This was a hate crime, an act of anti-Semitism. This is not a country of hate and violence. This is a country of freedom. We should not come home scared and we should not practice our religion in fear. We cannot stand for this,” he said. He asked for people to vote. Student Kristina Greg also called for action. 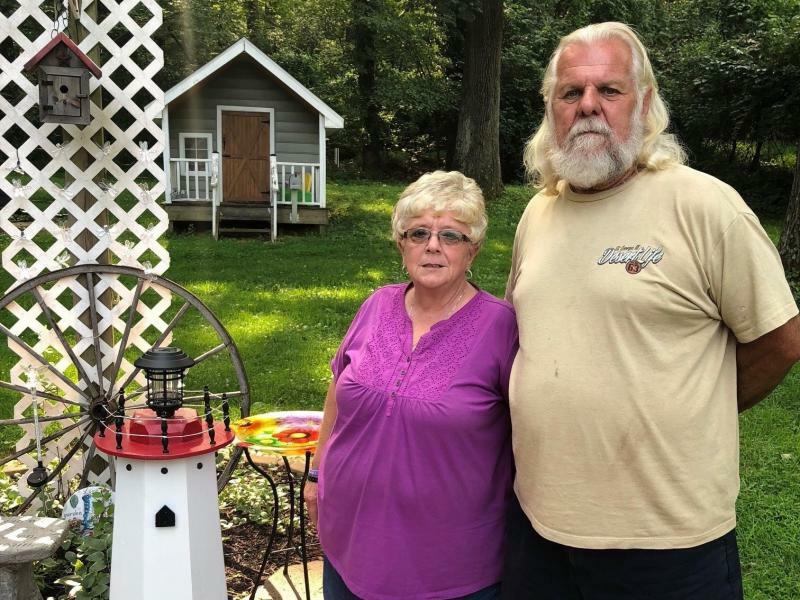 “The fact that a man who disagreed with their beliefs felt the need to walk in and destroy their lives means something needs to change,” she said. Baran Munro said some younger students were scared. “A lot of them were like ‘I go there, or my family goes there, I was there last week,'" she said. One child asked her if he would have to see the bullet holes in the doors of the building on his next visit. She said, unfortunately, teachers often field questions about other tragedies. The school has a Google Doc full of resources about how to talk to kids about mass shootings. “There have been so many that you almost have a curriculum for it, which is not how we want to be as educators,” she said. She advises parents to have a general conversation with young children because they are likely going to hear about the situations. She directs her teachers to allow students to guide the conversations. “Just say, what do you know about it? Find out where they’re coming from. Usually, it’s a much simpler place than the adult,” she said. She said teachers are not only helping student’s process tragedy. They’re also teaching them that it’s their job to make the world a better place. “In Hebrew, it’s Tikkun Olam, which is basically 'repair of the world,'" she said. "So from a very young age the families and the school share and partner in helping kids understand their place in the world, their place in history, and what that means." Baran Munro said the school has been increasing security measures over the years. She never goes anywhere without her cell phone and walkie-talkie. Her parents were Holocaust survivors who she said taught her that bad things will happen, some will get through it and you keep living in faith. Members of Pittsburgh's grief-stricken Jewish community endured another round of funerals Wednesday for victims of the synagogue massacre, a day after President Donald Trump encountered hundreds of protesters when he came to town to pay his respects. There are many reasons why the opioid crisis is so hard to confront. One of them is social stigma. It often extends beyond users themselves, to their families. Hope and Pete Troxell live in Frederick, Maryland. Last year, their 34-year-old daughter Alicia died after overdosing on fentanyl – a synthetic form of heroin. She was seven months pregnant. Hope says before Alicia's death, they often felt the weight of judgment. "So many people look at these [people] that are addicted to drugs, they call them every name in the book. They're junkies, they're thieves."